The 'Settlement' backpack from Herschel Supply Co. is crafted from durable fabric and lined in signature striped fabric. Versatile and practical, the rucksack features two adjustable shoulder straps, a top handle and zipped pouch pocket to the front with key clip. A zip-around fastening conceals the spacious, candy stripe interior that houses an internal media pocket with headphone port, and a 15" laptop sleeve. 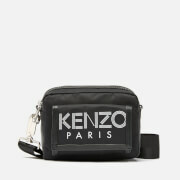 The bag is complete with exposed zips and pebbled leather zip pills. Classic Woven brand label to the front pocket.